While staying as a guest of my former coworker's Uncle in Trinity Beach, Australia, I observed the teamwork of ants on the attack one morning. 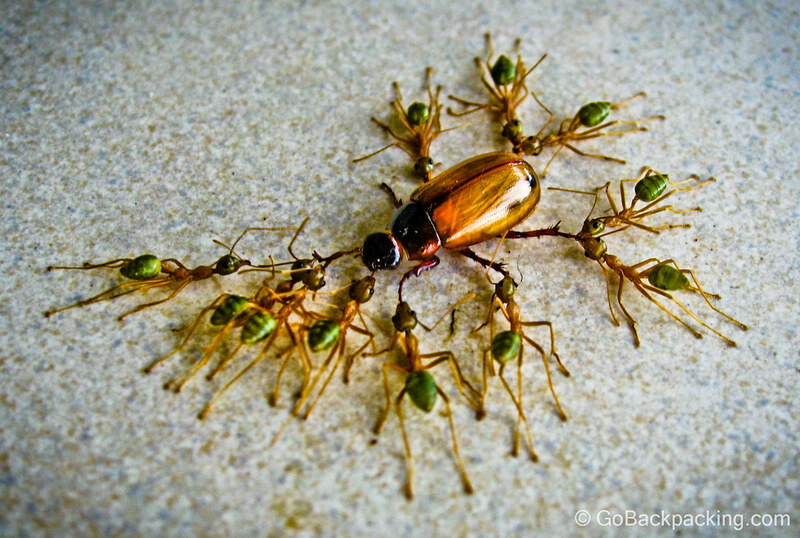 Looking at this photo years later, I still marvel at the way each ant can be seen doing its part — a leg here, an antenna there, to wrestle the beetle into submission. Awesome photo man and worthy of a National Geographic submission for things caught in the wild! Thanks Troy! Through traveling so much, I’ve learned to keep an eye out for the little things (bugs) which can be just as amazing as the big landscapes (Himalaya). I’m going to have to agree with Troy on this one, stunning photo worthy of submission to some sort of travel publication. Keep up the good work Dave. This is beautiful, nice shot! Never thought of ants to be this beautiful.